I had a few people ask me about the night light in Emanuel's nursery, so I thought I'd share about it. When it comes to baby gifts, I love to give something personalized. 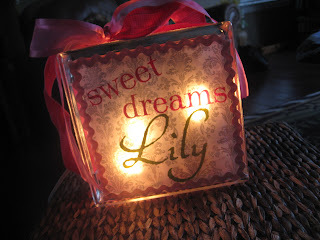 Here is a tutorial for a personalized night light - one of my favorite things to give! For those of you that have asked, the font I used on the one I made Kelly is called monogram kk. 1. Cut the vellum to the size of the face of the block. 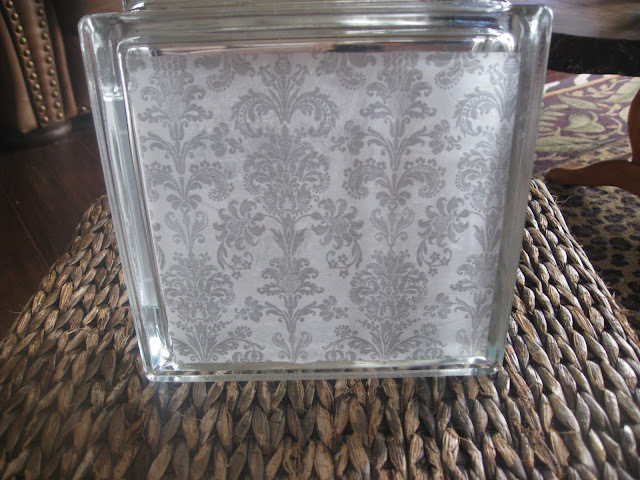 Use Mod Podge to apply the paper to the block. For less wrinkles, I put the Mod Podge on the block & on the piece of paper - it tends to lay better that way. 2. 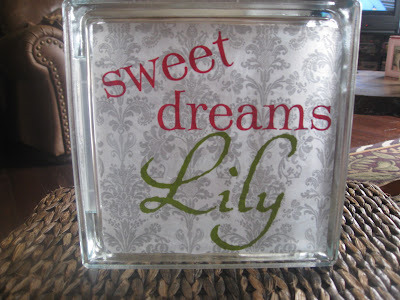 Place your words on the block in your desired layout. 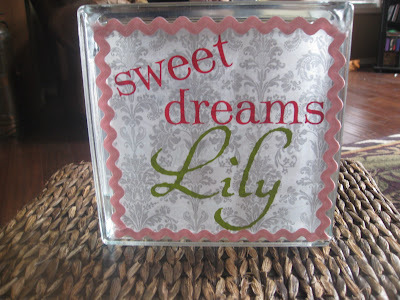 You can either use stickers or cut the words with your Cricut. If you cut them with your Cricut, you can either cut them on vinyl and apply them directly, or cut them on scrapbook paper and glue them on. 3. Frame the edges of the paper by hot gluing some type of ribbon down. 4. The side of the block has a removable piece of plastic. Take that off and insert lights in the block. (I never put the plastic cover back on because I tie ribbon around the block at the end.) 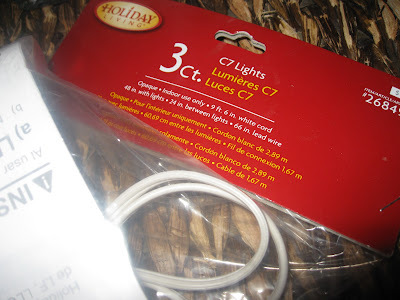 I prefer C7 lights, which are basically 3 large Christmas bulbs, because the cord has an on/off switch. However, it's hard to find these except for Christmas time, though there are some places you can order them online. If you can't find them, then I have used a 20 or 30 count white strand of lights, again from Hobby Lobby. They have these displayed next to the glass blocks year round. My Hobby Lobby also recently started selling a single light, which is what I've been using lately and it works fine. 5. Finally, finish it off by tying a ribbon around the block. Here is the finished product with the lights off, and then with the lights on. I love this! Great idea!! Love this!! Thanks for the idea :) I made the glitter balls you had on here for Christmas and they were a big hit!! What a wonderful gift!! Thanks for sharing & I can't wait try it out. Happy days ahead...can't wait for a baby update! What a cute idea, I am going to have to try this for sure! A friend gave me one of these for Christmas and I love it! Love this! 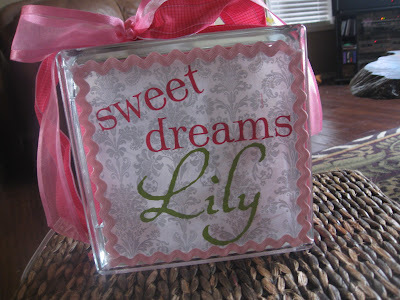 Definitley will keep it in mind for a cute, personalized gift. Very pretty! What a wonderful idea! I don't have a Cricut, but I'd figure something out. I'm bookmarking this for Christmas presents, shower gifts, who knows! I don't comment much, but I just wanted to say that I love your blog and I have been following it for a long time! You are so crafty and I can't wait to try some of your awesome crafts! This is so sweet! I'll be featuring this on Friday-hope you don't mind. I never would of thought to use a glass block like that! Love it. This is one of the cutest crafts I have ever seen--thanks for sharing! I just posted the link on my organization blog. Thanks again! This is sooo cute!! I'm definitely trying this out. I love this and really wanted to make one for a pregnant friend's nursery, but I have a few questions. I simply cannot get the vellum to lay flat no matter what I try. I followed your directions using Mod Podge on both the block and the vellum to no avail. But mine is full of wrinkles. Any tips? Also, I used my Cricut to cut out vinyl letters, but they won't stick to the vellum. They just stay put right on the transfer paper. In your example, did you use transfer paper, or did you just eyeball it by peeling and sticking yourself? I am going to table this project for this particular friend, but I have another shower in a couple of weeks to try again. Thank you so much! I am trying this too and mine is full of wrinkles! :( Any suggestions? What type of Mod Podge do you use? What do you apply it with? If it's full of wrinkles, just try to push them out from the center right after you put the paper down. You won't be able to get them all out, but you'll notice as it dries, the wrinkles just work themselves out. There might be a few small ones left, but I think it just adds texture to it. I just use regular Mod Podge and apply it with a foam brush. Hope that helps! 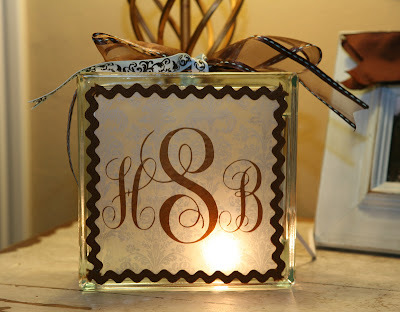 I am going to try this as soon as I get some mod podge,I have everything else. I am so excited.I am making one for my grand daughters birthday. I'll let you know know how it turns out. 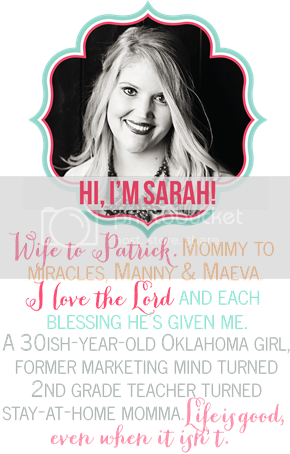 Sarah, I'm trying to do this very same thing with the single light bulb from Hobby Lobby, but I can't get the light to sit correctly. 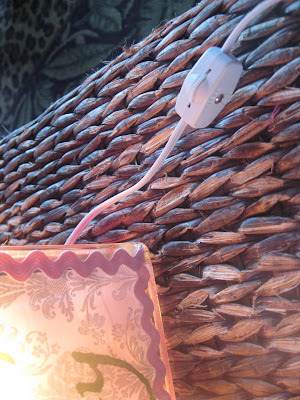 How do you keep your light in place and do you still not use the clear circle piece with the single bulb? Any suggestions will help. thank you!! Hi, I think this is so cute! My only question is, I can not find that kind of vellum paper:/ Michaels and hobby lobby, I have only found clear vellum paper. Where can I find some like the one you have in the photos?